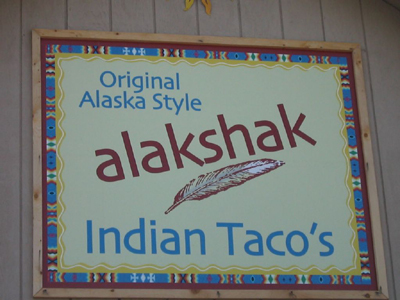 Complaint: Incorporation of an apostrophe in the construction of a plural noun – a misdemeanor; making grammatical error permanent and mounting on a surface so as to expose said error to Alaskans and visitors to Alaska – also a misdemeanor. Defendant: Vendor specializing in the development and consumption of Alaska-style Indian tacos, a never-before-heard-of foodstuff that defies further understanding at this juncture. Report: Officer C. Pfeifer was on patrol in Homer, Alaska. Officer claims to have been enticed by the notion of having a “taco” but was unsure if there were more than one available for consumption. Fine: A paper of no less than eight pages explaining what an Alaska-style Indian taco might be.